Demon's Crest follows the story of Firebrand(Ghouls and Goblins, Gargoyles Quest) on his journey to reclaim the Demon's Crest and achieve ultimate power. After winning a massive war over the Crests, Firebrand is weakened and eventually ambushed by his nemesis Phalanx. Left for dead in a Colosseum With just 1/5th of the Crest of Fire in his possession, Firebrand has to slay a zombie dragon, escape the Colosseum, reclaim his Crests, and hunt down Phalanx to exact bloody vengeance. After my previous Publication I immediately discovered movement optimizations in stage II that resulted in a ~100 frame improvement. I spent the next few months Brainstorming improvements, serially viewing my TAS almost nightly. When I returned to the TAS in September I decided to take a new tact by picking up the Stage II Urn on the first visit and this was responsible for the major improvements I achieve in this run. I also decided to try and improve the skull bash mini-game. I spent a lot of time deliberating the possibilities, routes, and road blocks I might run into by attempting this new strategy. The RTA player Broedgeman was very helpful in determining the most optimal route - as he is possibly the only other person in the world who knows as much about the game as I do. I submitted a 980 frame improvement to the published run at the beginning of Novemeber as a W.i.p. and since then I have gone on to save a total of 1,049 frames over the published run. I was able to achieve the majority of my goals and I feel that another significant improvement will be hard to find Without better knowledge of how lag is generated (and how it can be avoided), as well as better boss RNG manipulation, I believe this is the most potential to improve this TAS now. Route change: Like my last publication, the majority of improvements come from Changing the route and Using the Mercury potions even more effectively. Movement: there were several locations where I am able to optimize movement across the whole game to either save time or reduce lag. SkullBash game: This was the first time I attempted to improve this segment and I was able to save 80 frames here. edge dashing: The collision detection is kind of funny. Notably, in stage 2 I abuse the change in firebrands hit box to slip the statues, and it is used in various places to Dash while falling. Holding L/R glitches the placement of Firebrands attack. Right Direction takes priority but the fireball comes out of the back of his head. 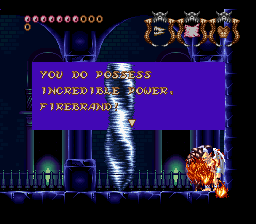 Hitting Bosses Early: In some stages, When the screen transition to a boss fight completes, you have control of firebrand for 1 frame. This is used to hit some bosses early. There are some fights where this is possible but the bosses are either invulnerable or off screen and others where this is not possible at all. Mercury Cancel: Mercury and Sulfur are the two potions I buy on the return trip to stage II. Normally, when defeating a boss and collecting their reward, you go through some text and are transported to the world map. Using the Mercury potion, I am able to collect the item and have a 2 frame window to execute the "Mercury Cancel", skipping any text and the world map transition via the effect of the potion: transporting firebrand backward one screen. This is used vs. Belth in stage IIb and vs. Crawler in stage V. The Sulfur Potion does not require any timing, it simply transports me to the world map, allowing me to avoid long and pointless hikes to the end of stages Ib and IIb. Zombie Dragon: The Dragon is set on a timer so I tried to narrate the fight as a sort of struggle for the recently wounded Firebrand. Graveyard: Pretty straight forward. I have to waste a few frames to manipulate the boss. Grab Useless Paper #1 and head to mini-boss. Hippogriff 1: Courtesy of ES. Town: pretty straight forward. Some frames (~15) are saved by extending the third dash slightly. drowned abbey: I pick up the Urn on the first trip, which opens up all the improvements in this run. Cavern 1: Pretty straight forward. The fire monsters cause a lot of lag dead or alive. Cavern 2: You can disable BG layer 2 to see in the dark. Making sure enemies I kill and statues I break don't drop items because that causes extra lag. Eye Ball Soup: Very laggy. Different fight but nothing new. I decided to go to the Skull Bash Game immediately. This took the majority of my effort this run and I'm able to save 80 frames here through highly optimized RNG and strategy. There are 25 skulls, I took the approach of lowering the average frames between skull bashes and reduced it from 46 frames to 41 frames. Arguably still can be improved but the RNG would have to be even better. I will be visiting this shop a few times through the run. Forest: Laggy enemies abound. Grab Urn #3 Head to the water cave. Water cave 2: Water floods pretty quick and owls at the top of the cave cause some lag. Break into the hidden door to collect life and set up for the mercury potion. Scula: Scula is a 2 piece boss. This is the first time Scula will be fought this early. I learned that Scula is actually fairly challenging without OP damage weapons. Because of this the fight is significantly longer, however the time saved long term is still worth it. Normally, ground gargoyle would deal 2 damage but Scula resists his attacks so Buster is used instead This also saves on pause menus. The roly poly part requires 10 hits from the buster while the main body requires 25. Grab the Health drop and Mercury Cancel back through the hidden door. Moat area: This was a unexpected benefit. Since I am coming from Scula's dungeon I am able to avoid one of the slowest, most awkward and laggiest parts of the game. Forest Fire: Flame Lord pops in to set the forest on fire. I get through while minimizing lag from giant fireballs and tentacle monsters. Pick up useless Relic #1. I was extremely happy when the mercury potion was able to remove the fire canopy. In other runs we have used death here but with the new route I had way to much health to die at a reasonable speed without slowing down to take damage. Flame Lord: this fight is the same. Pillars & Snakes: Unchanged, tornado Platforms, grab Urn, head to next area. Floating zombie knights: Increased horizontal movement is blessing and a curse. I try to minimize the number of times I start/stop flying and utilize increased movement speed by staying airborne. pillars & snakes 2: Immediately Mercury back to Floating Zombie knights. Floating Zombie Knights: business as usual. Hippogriff 2: Slightly improved timing of hits since I have enough health to take damage and survive. Jungle Tower: The platform allows me to make another huge improvement. Optimizing the tornado jumps is pretty awkward at first, because you have to wait for the tornado to become a platform and then land on them. outer wall: I have to drop to get useless relic #2 and Tornado Jump to the top right to grab Useless Paper #2. This segment is a little more laggy and also vertical movement is altered in this room making falling speed lower and increasing my jump height significantly. Jungle Tower 2: Platform maker again saves a lot of time here. Arma 2: Arma 2 has 32 HP. 24 damage is dealt in ground shots (2 damage) while the remaining 8 is dealt with air shots (1 damage). This fight can also theoretically be improved if Arma can be manipulated to stay on the ground. For that reason, some hits are not timed perfectly with his vulnerability. Ice Hell 1: Tornado Jump to Urn #4 then Tornado my way through. Ice Hell 2: Tornado to the top of the mountain and Dash my way down. Grab Useless Paper #3. Cruelty to animals: This boss is pretty easy. Not much to say. He gives me Demon Fire, a powerful weapon. Then Mercury Cancel back to Ice Hell 1. Ice Hell 1: Again, Just tornado through the mountain up to the castle. Ice Castle: Tornado jump up the surprisingly lag free passage. Headbutt the Ice block to reveal a door which leads to a life vessel. Owls and Axe Men: I take this time to use Useless Relic #2 which increases the drop rate of coins. I collect ~200+ GP here for virtually no reason. Flier 2: Hit before the fight starts. Bats in the Dark: Kinda laggy. I switch to ground gargoyle to bash the statue revealing Useless Relic #3. Then Just navigate out while trying to reduce lag from bats. Arma 3: Still happy with this fight. Town: I stop in to the potion shop to fill my 4 Urns with 2 mercury and 2 sulfur (32 GP total). These allow me to save a boat load of time and are worth the minor side track and then some. Drowned Abby: head to the boneyard. Boneyard: Dash and Jump through, grab the Life vessel from bone Pile and head to the boss, pretty straight forward. Skeletor: Skeletor (aka Bone Daddy, aka Belth) pops out of of the ground and seems to beckon you to finish him off?? Crest of Time Wipes him out in record time and Mercury #1 saves me a trip to the world map. Drowned Abby: Just a straight shot to the caverns. Caver 2: a quick trip to the bottom to grab a health vessel and Sulfur #1 saves the trek through rest of the cavern and teleports me to world map. Mountain Area: Same deal. mitigate lag between enemies, dashing, and pillars collapsing. Platform Area: Tornado Jump again saves a lot of time and Sulfur #2 saves me another hike to the end of the stage. Moat: Pots, Skeleton Birds, and Mermen make this segment a little hard to navigate while reducing lag. Castle: Dash up to the hidden section, fly up the hole, break the statue for a life vessel and head up to the boss. Crawler Drops down behind you and tries to scare you into moving forward but I take damage and walk through him to head up from where he came to grab a life vessel. This also sets up for the Mercury Cancel. I noticed that when I drop down from this room, my character is in standing animation so I am able to ground dash in mid-air. Crawler: manipulate crawler to throw babies at you so you can hit him three times a cycle. Mercury again to save a trip to world map and teleport me back to where crawler came from. Drop down to the bottom floor of the cavern, its time to take a swim. Again, edge dash helps to optimize movement. Under the sea 1: Use the standing animation trick to dash and switch to tidal gargoyle before I take damage. Moving around in this section is awkward so I use the spikes/enemies to propel my character in the right direction. The latter half of this section and the next section were definitely the laggiest/most awkward section to TAS. Holuthorion: I kept wondering why I wasn't able to hit him till I removed BG layer 1 and revealed Holuthorion is two separate hit boxes that aren't attached. After I did this the fight became much easier. Cathedral: Pretty straightforward walk to the end. Dashing is laggy here due to enemies breaking windows/shooting arrows so like ES I opt just to use Crest of Time. Hippogriff 3: I kinda style on this boss. I know in the guidelines it says . .. not to spam excessively but as a stylistic approach I think I did a good job so I hope this will be accepted. Bell tower 1: Tornado to the top, knock the bell for the last life vessel. Long wait time allows me to create some shenanigans. Cross the gap: Another section with improved horizontal speed. Using the Claw spell allows me to stick to the spikey stage hazards. Grab Useful Relic #2 which increases the damage of my spell attack. Bell tower 2: Getting the floating bull heads to behave was kinda funny. Otherwise, thanks ES. Mummy Hall: Straightforward, no lag or anything. Just a walk to the next boss. cruelty to animals 2: with Crest of Time and Fang Relic, This boss goes down in 4 hits. Phalanx 1 & 2: Tornado platform allows me to jump higher and thus optimize the hits a little better. In Phalanx 1 and 2 Demon fire does 6 damage while Legendary Gargoyle does 5. In the first phase, Phalanx does not have enough health for this to matter. However, in Phalanx 2 I am able to kill 3 hits faster with extra damage. Pause menu at end of fight to use tornado to Damage Phalanx 3 ASAP. Phalanx 3: This boss is supposed to use his 4 hands to cover his face but I essentially stun lock him indefinitely and he goes down in 13 Hits. Thanks ES for this strat. There is always room for improvement. However I believe this will be the last significant improvement to this category. There is room for lag to be reduced and for boss fights to be manipulated better but I don't see anyone breaking the 1,000 frames saved. I hope everyone will enjoy watching as much as I enjoyed creating this movie. If you have any questions please don't hesitate to ask in the submission thread. I think that covers just about everything. Thanks for Reading, Thanks for watching! Samsara: Accepting as an improvement to the published run.